Chicago "L" line to Brookfield Zoo? 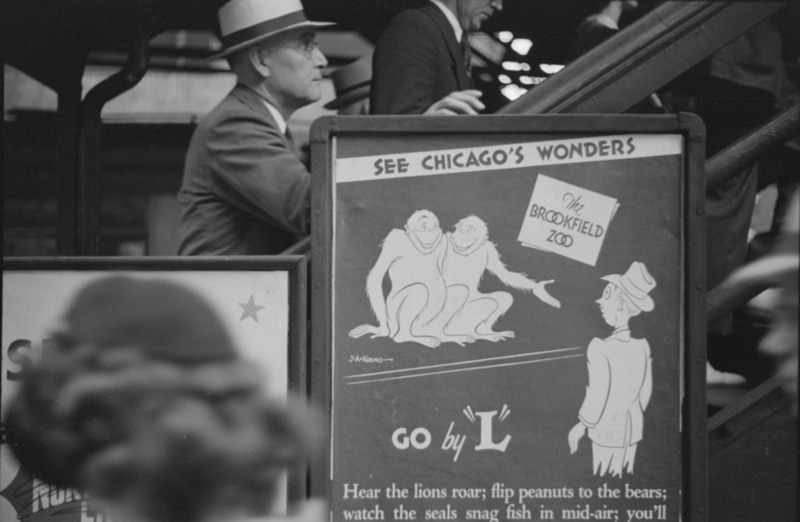 Was there ever an "L" line that ran to Brookfield Zoo? I don't mean the train that runs from Union and has for years, I mean the "L". I looked at Chicago-L.org and nothing there. No luck w/other searches. I think there wasn't an "L" line that ran to the zoo. But someone else said yes there was. One of us is wrong. Question: which one? Re: Chicago "L" line to Brookfield Zoo? There was not. Most certainly not. Dave, the farthest west The El ran outside of Chicago (near Brookfield, I know the O'Hare line also runs west) is the Desplaines Ave. stop in Forest Park which existed for access to the cemeteries back in the old days. Actually closer to Brookfield was the old Douglas Park El, later the Blue Line, now called the Pink Line that actually had stops all the way to Oak Park Ave. (6800 West) just off of Cermak Rd. in Berwyn until 1951. The CTA scaled that line all the way back to 54th Ave. & Cermak in Cicero where it still continues to stop today. In the 1920s there was talk about running the Douglas Park El (which ended at Oak Park Ave. in Berwyn) all the way to the suburb of Westchester near Manheim Rd. That never happened. A few years ago I saw a VERY cool promotional booklet printed in the 1920s by a real estate developer showing the improvements being made in Westchester in preparation for the El stop there. I should have bought that darn booklet! [b]There was a blue and white street car that ran from east of Cicero on 22nd street on the west side of the tracks across from Western Electric and took us through to Brookfield Zoo. I remember it went through a wooded area and also had a wood or coal stove to heat the train. That was in the 40,s. It did stop in front of the zoo. You can see the line on Chicago History Museum site on the 1921 map. Is that what you may be reffering to? It was on the ground not elevated. [/b]It was a ground level street car. The CSL stopped on the east side of the bridge on cermak and we had to walk under the tracks to take the other street car. Edited 2 time(s). Last edit at 10/04/2012 12:38AM by Richard Stachowski. No Richard, there was an actual ground level CTA "El" line, basically an extention of the current Pink Line that runs out to 54th Ave. & Cermak Rd., which ran all the way out to Oak Park Ave. (6800 West). The line ran along Cermak Rd., just a few feet north of the street, until it was dismantled in 1951. Look at this google map to get a better idea. Look just north of Cermak Rd. at Oak Park Ave. and you will see a street that google maps is calling "21st Place," well it isn't called 21st Place, the City of Berwyn officially calls it "Vacin Fairway" (named after a previous mayor) but everyone calls it the "El Strip." It's the pathway that the El ran from 5400 West all the way to 6800 West. The Town of Cicero and City of Berwyn now use it for parking for businesses along Cermak Rd. 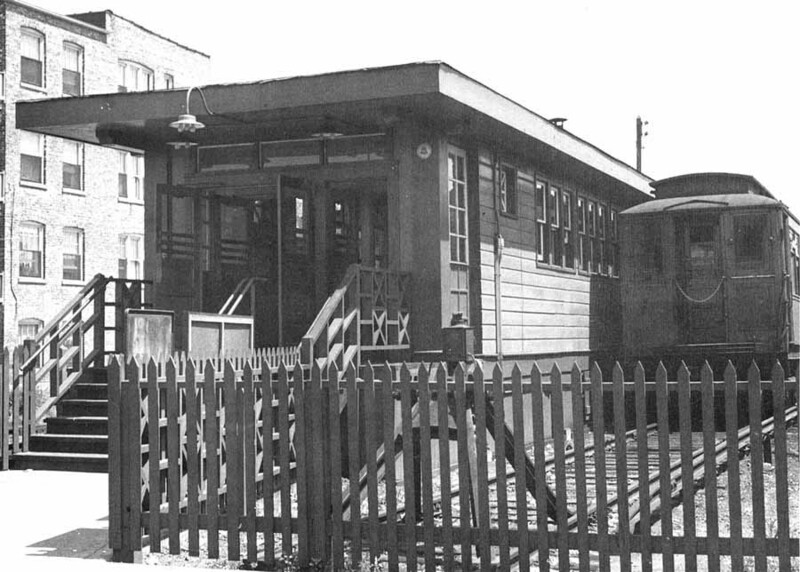 Here is a photo from I believe the 1930s showing the El platform and building at Oak Park Ave. The apartment building seen in the background is still there and can be seen in the google maps link of "21st Place" & Oak Park Ave.
Just to add a but more history, there was a "rumor" in the neighborhood after the CTA discontinued service in part of Cicero and in Berwyn in 1951. It was said that the CTA, which owned the land, was going to build government subsidized housing, a.k.a. housing projects, on the land which ENRAGED local residents. If anyone here knows the histories of Cicero and Berwyn then they know that the neighborhoods were Eastern European strongholds that weren't to keen on the idea of a "segregated neighborhood." I don't know the "official" version of how this was resolved, but I do know that the two towns gained control of the land. Edited 1 time(s). Last edit at 10/02/2012 12:38AM by Berwyn Frank. Actually there was a L line that ran to Mannheim and 22nd in Westchester which lasted until 1951 and started at the current Blue Line DesPlaines station area. I wouldn't call that close to the zoo though. Edited 1 time(s). Last edit at 10/05/2012 12:19PM by daveg. Daveg is correct about the trains running out to Westchester. The current CTA Westchester bus service is a relic of that train line. In addition, there was a special Rapid Transit funeral car that used to run on a spur line out to Mount Carmel Cemetery. I believe there were a few stations in Chicago that were equipped with an elevator to hoist the coffin up to platform level, and the single car which carried both the coffin and the mourners ran out to the cemetery entrance at Wolf and Roosevelt Roads. The service only lasted a few years, and I know one of the stations equipped with an elevator for the service was the current Polk St. Pink Line station. The service was outlined in a book on Chicago Rapid Transit that came out a few years ago. Interestingly enough, there were also streetcar hearses, which also did not last too long, which ran out to cemeteries serviced by Chicago Surface Lines. The EL you are probably thinking of was the CTA line that ran in the alley along the North side of 22nd street. The El operated as far west as Oak Park Ave until 1951. There was NEVER an El line that went to Brookfield Zoo. The [b]Blue and White Streetcars[/b] were the [b]West Town Company[/b] cars, and they operated until 1948.
where they turned WEST again and proceeded over the Des Plaines River - Crossed over 1st Ave... and stopped right in front of the SOUTH gate of the ZOO. There is a small [b]Forest Preserve Grove[/b] about 3500 South 1st Avenue. Pull into the parking lot and walk over to the river. Almost even with the GROVE entrance.. You can still see the concrete bridge support piers where the streetcar tracks crossed the DesPlaines River. My grandmother bought a home at Norfolk and Congress in Westchester simply because it was within walking distance of the El stop. When they tore it out in 1951, she was devastated. Then, they put the Eisenhower though and cracked the plaster in her little bungalo, and that about broke her heart. I've seen that photo and if it said "all the way to the zoo" well.... that would be a horse of another color. I think one could take the "L" to the end of the line then hop on some other sort of transportation the rest of the way. I found a article in the Tribune archives dated 7/1/34 titled "How to Reach The New Brookfield Zoo"
The article has a map and mentions that you cpould get to the zoo by four methods Road, rail, street car and elevated. However the instructions indicated "Visitors using the elevated lines must also change to the Lagrange Street Car one half block south of the Douglas Park line at Oak Park Avenue. So it seems that at least in 1934 there was no direct route to the zoo without transferring to a street car. I also saw that the zoo was suppose to have opened for the 1933 fair. Reminded me of an old brochure for Brookfield Zoo that my grandmother had. You took the Garfield Park L to the end of the line and then transferred to the West Towns streetcar. The simplified graphics seemed to imply that there was a physical connection. Interestingly enough, the CTA contemplated buying the Chicago and West Towns after it was formed, but decided against it.